How to Recover the Lost Apple Music Songs on Your iPhone? Most of the time, technology is pretty great and makes life a lot easier. However, technology is still pretty flawed and sometimes does inexplicable things for seemingly no reason at all, like when losing Apple music songs. If you have just witnessed this, a quick survey shows that you’re not the only one who has witnessed this, in fact, for years other iPhone owners have suffered from this cruel, seemingly randomly fate. This issue can totally occur without being triggered by any of your actions. For example, you might be having a long day, and after a period you have spent thinking of what to do to unwind, you thought to play your favorite song from your iPhone, but unfortunately, you have lost all your apple music! Whatever the reason for this, here now, I’ll offer you effective methods to avoid/solve Apple music files lost issue, the solution to restore lost Apple music songs with ease. Check if music takes up sapace on your iPhone - Connect your device to your PC, launch iTunes, and see if your music is taking up space on your iPhone; iTunes tends to categorize the phantom music as “Other” media, instead of music. Check the little storage capacity breakdown bar presented at the bottom of iTunes when your device is selected. Just in case you have so many “Other” media that are suspiciously using up around the same storage capacity as your missing music should: Be sure to backup your device to either iCloud or your computer and then wipe all your device’s content and settings. After doing this, you can simply restore your device from the backup. This has been reported by many iPhone users that it will make your device identify your music. Depending on how much data you are working with, the backup and restore process might take a while. If you want a faster result, you should backup to and restore your data from your PC. If this step doesn’t work for you, the other method below will surely do. Many iPhone users prefer using an iTunes music managers to help them keep their iTunes music library properly managed, without encountering the problem of losing Apple Music songs. iMyFone TunesMate is one of those third-party iTunes music managers that will help you solve the mystery of lost Apple music songs. Besides, iMyFone TunesMate has so many mouth-watering features below, which is why it has won the hearts of many iPhone users. 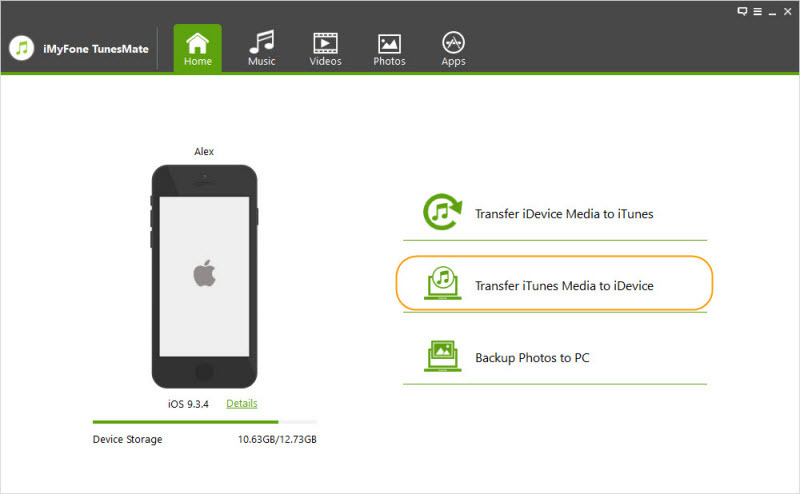 Two-way transfer: TunesMate gives you the access to transfer files from iPhone to PC or iTunes or the other way round. Access to Unlimited libraries: With TunesMate, you can transfer music from iTunes to unlimited iDevices, breaking almost all the iTunes restrictions. Restoration of lost/damaged/corrupted library: TunesMate helps you get back all your lost data. You can use this feature on all iDevices. Supports third-party music files: TunesMate allows you to use files that you have purchased from other places; it doesn’t restrict you to files gotten from Apple alone. 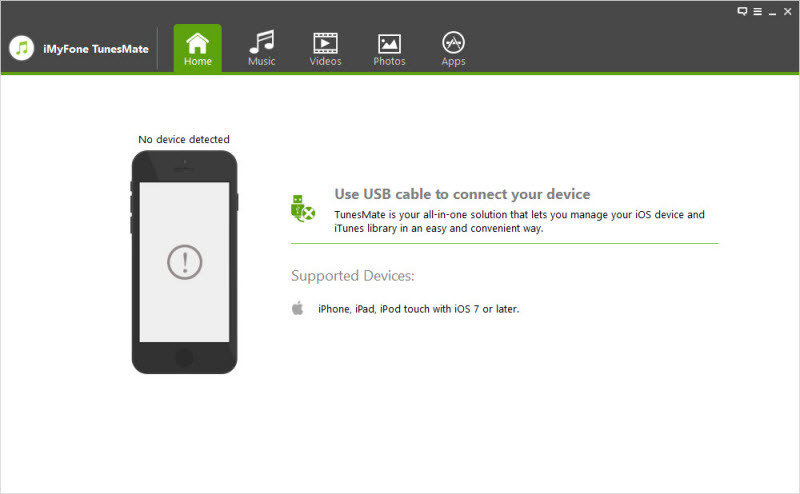 Step 1: Launch the iMyFone TunesMate app, connect your device to your PC with an original USB cable. Step 2: After a successful connection, you will see a summarized specs of your iPhone. This gives the assurance that your iPhone was recognized by the app. Step 3: Transfer iTunes media to your iPhone. To do this, choose your lost Apple songs on your iDevice, just one simply click on “Transfer iTunes media to iDevices”. Then click "Transfer" button to begin the transfer process. Click "OK" button to finish it.